I love to knit from my stash, and not just from any part of it: I love knitting from the littlest bits and bobs kicking around in the corners. The partial skeins, the lone discontinued yarns and colors. Better yet, I love using up all those scraps to produce a piece for which I might have easily bought yarn, not just one which provides good way to use up old yarn. You could say I can get a bit obsessive about making sure my stashbusters can stand on their own merits. Remember the Ultimate Stashbuster Vest? Ah, yes, that was a fun one! Although I would love nothing more than to dive into an all-consuming fair isle garment right now, I’ll save that for winter break. Until then, I’m happily knitting along, striping my way through life. 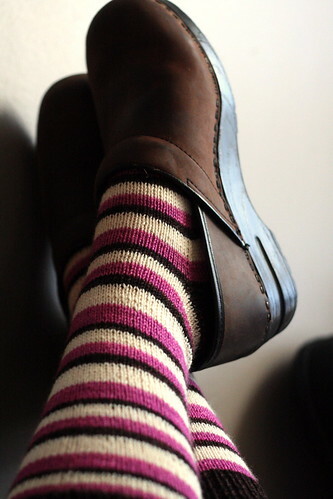 Inspired by these lovely socks, I’m calling this pair “Never Enough Chocolate” because they remind me of Neapolitan ice cream, which always seemed to me to have far too much vanilla and strawberry. 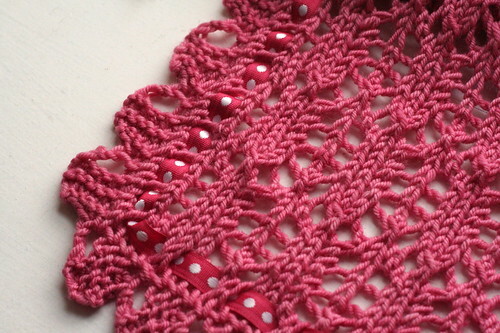 I had lots of pink and white yarn going into this, but not much brown. To completely use up three colors required some weighing and a lovely little bit of algebra (of which the striping pattern is the result), but it worked! I have absolutely nothing left. 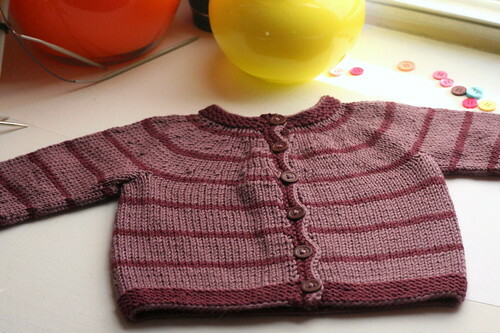 Next, as I mentioned this summer, I needed a good baby sweater for my new (and first!) niece, Amelia. What better than to knit up a Budgie, since O wears his – the one grumperina sent him – all the time? He wears his Budgie with the balaclava osloann sent him in part for warmth, and in part so general public will know he is loved by knitterly peoples. Can you tell? I had to change the striping pattern on Amelia’s Budgie because I had unequal amounts of yarn, and I substituted buttons for the zipper because Amelia will outgrow this long before she identifies buttons as potential food. Otherwise, as always, I did everything grumperina told me to do, and it’s perfect! Of course! Several years ago, Maritza and I joked about having, “What Would grumperina Do?” t-shirts made. It is a question that runs through my mind when I’m unsure about a project. The answer, of course, is to rip. Always. I wonder from how many hours of unhappy knitting she’s saved me??? Finally, in the last bit of striping, I slowly eked out another pair of socks, combining leftovers from my Mill Creek Cowl together with Drunken Bee Sock scraps. I thought this color pairing would be rather unsightly, but they look much nicer than I had expected; I like this mix a lot! With these two pairs of socks, I scraped the bottom of the barrel of my sock yarn stash. All that remains is a Koigu partial and a darning’s worth in other colors. I once had sock yarn enough for 21 pairs, and now I have nothing but a lot of finished socks! What a great feeling! So many lovely things from “leftovers.” I’m in awe! Wow, love the destash and the projects. A perfect name for the Neopolitian socs! Oh man, that “what would Grumperina do” thing is hilarious. I can’t even tell you how many times I’ve thought that. And yes, it usually involves either ripping or at least stopping and figuring out how to do things the Right Way instead of the Easy Way. Love the socks, espesially the first pair. And the babyjacket is adorable! I personally think it’s great to use up your stash because that makes room for new ones! Because novelty is always more attractive than oldies (well almost always!) Love all your projects above and enoy your WIPs! I just wanted to let you know, since you seem to be whipping through your stash (gorgeous knitting, by the way!) that Zibeline Knits’ Etsy shop is having a sock yarn sale. Now through Christmas, all hand dyed sock yarns are on sale, and if you use the coupon code BLACKFRIDAY15, you will get an extra 15% off of your total order. I’m intrigued by your use of algebra to come up with your striping pattern; very nice results! Very inspiring! What kind of percentage do you factor in for the heel and toe sections? I am so happy that I discovered your website. 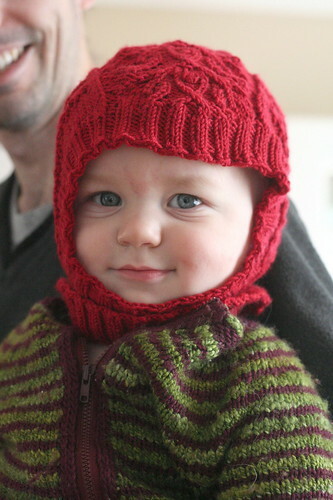 Your colorwork is beautiful and I also am a fan of using every last little bit of yarn. I can’t wait to read more. And, sadly, algebra is not my forte. Love your blog; your talent is an inspiration to me. I’m really curious to hear more about that last piece of pink knitting! Thank you so much for your inspirational blog posts. 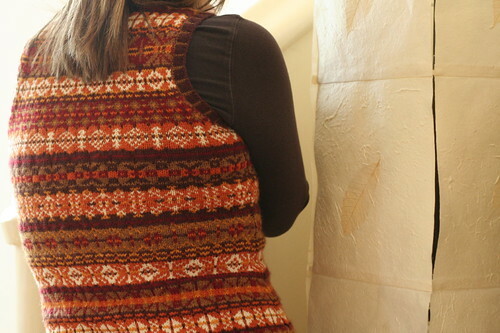 I love reading about your methods and seeing your beautiful knitted items. 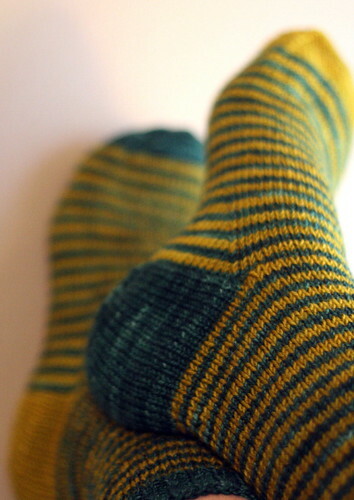 I am seriously intrigued with your yellow and turquoise striped socks and I have some blue and yellow yarn I would like to tackle socks like this with. My question for you is pretty basic. How do you carry your yarn. I am making the assumption with such short rows (on these particular socks it appears that you are doing two x two) you would not cut your yarn. Are you using a jog less method, do you carry up the back or the side. I would love your insider secret here. Thanks, thank, thanks! Super thanks.